Secretary Bryson's visit to China continued today in Beijing where he started the morning with a breakfast with U.S. and Chinese CEOs. The breakfast was led by Secretary Clinton and Secretary Geithner, with United States Trade Representative Ron Kirk and Ambassador Gary Locke also joining. The group discussed the importance of the U.S - China economic relationship and what can be done to continue the growth of trade and investment between both countries. Bilateral trade between the U.S. and China reached over $500 billion last year, with U.S. merchandise exports reaching $100 billion for the first time. The Secretary's day continued as he joined Secretary Clinton and Secretary Geithner for separate meetings with Chinese President Hu Jintao and Premier Wen Jiabao. 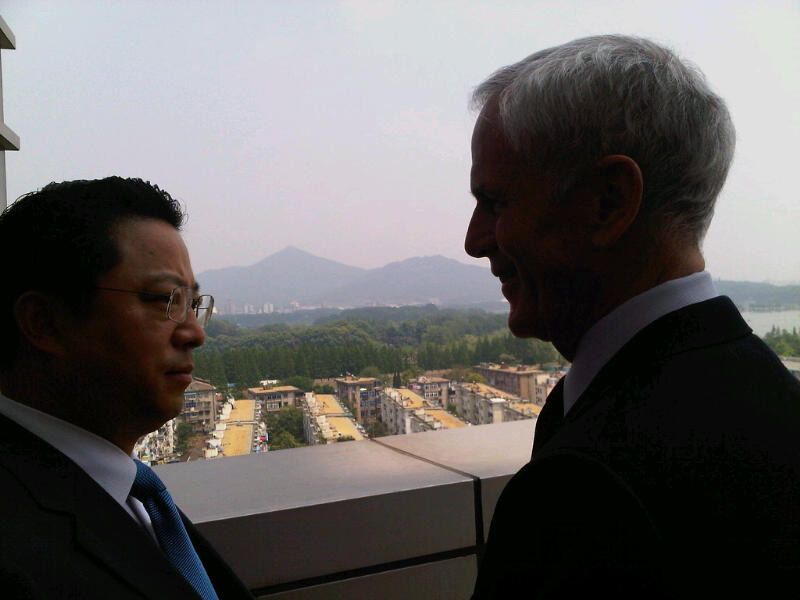 Bryson then joined Ambassador Kirk for lunch with their Chinese counterpart, Minister of Commerce Chen Deming. Throughout the S&ED, Bryson has stressed the importance of the U.S. - China economic relationship and how it is critical that both sides follow through on commitments made not just at this S&ED, but at prior and future talks. Or as Bryson put it, "we must work harder... we must be bold... and we must follow through." After the government meetings, Ambassador Kirk and Secretary Bryson participated in an event with the American Chamber of Commerce in China and the U.S. China Business Council. There Kirk and Bryson heard straight from U.S. business leaders doing business here in China. They discussed opportunities, challenges, and what the U.S. government can do to support increased exports from the United States to China.